A beautiful 4-bedroom house is waiting for you to call it home in Dillon. With its spacious rooms and mountain views, you won’t be disappointed! Located in a popular Dillon neighborhood, you’ll be near schools while also having access to skiing, golf, hiking trails and National Forest land. So you can enjoy all the conveniences Dillon has to offer and be close to nature at the same time. This gorgeous log home has upscale finishes that include copper quartzite, tile, hardwood floors, granite counters and stainless steel. There’s even an in-law apartment for more privacy or rental income. Furthermore, this multi-level, residential house has a fireplace, gas-jetted bathtub, patio, vaulted ceilings and a skylight. 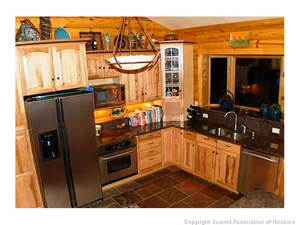 You’ll take great pleasure in mountain life when you move into this lovely home. It’s quite a jewel in Dillon! Dillon is a very well-liked town in Summit County. Although it isn’t as active during the winter months, it comes alive in the early spring as the reservoir melts. With free concerts, farmers markets and other great events, Dillon is known for its outdoor fun. In addition, the Dillon Marina and Tiki bar draw many residents and tourists alike. Also, the marina has all different types of water craft for rent, if you don’t already have your own. So you’re always able to enjoy time on the lake during the warmer months of the year. Please be aware that I’m available to help you view other Summit County properties, too. Feel free to check out my website for updated listings of different types of homes that are currently on the market. Or tell me what kind of property you’re looking for and I can research homes in Summit County that meet your needs. In addition, you may want to check out my Kelli Sells Blog other information on buying or selling homes in Summit County. I always make sure to keep my blog up-to-date so that you have the latest information on all of the real estate trends in this area. Remember that you can contact me at your convenience any time. Just send me an email at [email protected] or call my office lines. I would love to be of assistance and help you find a home in Summit County that’s right for you.